Imagine your favorite Indian restaurant: the spices in the air, the richness of curry, the crunch of samosas, the buttery-ness of fresh naan – all ending in a cozy food coma. Ever wish you could extend that delicious comfort? 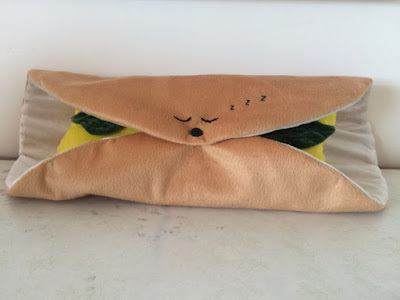 Well, you can: in the form of cute and cuddly stuffed toys called Happy Bellies. 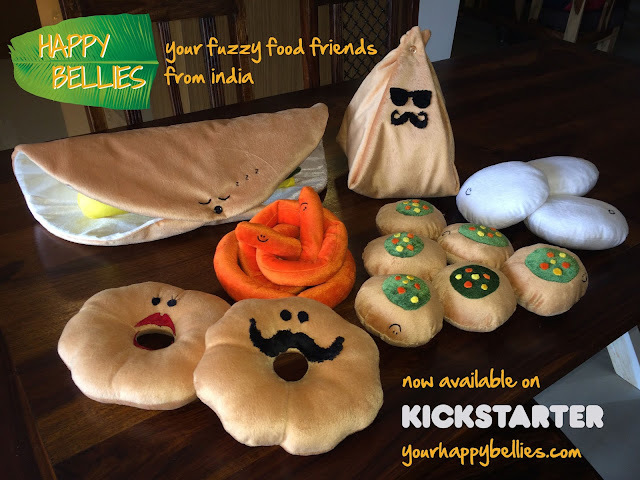 Happy Bellies is a staff-picked Kickstarter project launched by three food lovers living in Bangalore – Diana, Jackie, and Avantika – who want you to be able to hug your favorite Indian foods, no matter where you live. The proceeds will go towards bringing life-changing technologies to villages in India, through Diana and Jackie’s non-profit Essmart Global. Diana is a close friend of mine from grad school and happened to be in Philly earlier this month. While we embarked on our own mini food crawl through Center City, we chatted about Happy Bellies, the different characters and crews, product design, and Diana’s efforts to learn Indian cookery – with plenty of tangents in between. This is Part I of our meanderings, with Part II to follow. We started at Metropolitan Bakery (262 S. 19th St.), a Philly mainstay. I wanted to try the millet muffin, which I had heard about on the podcast the Local Mouthful. While our conversation there wasn’t really quote-worthy for this post, we did have some laughs about AirBnB’s Obama O’s, YouTube stars, and savvy swag by presidential candidates. Fried chicken and donuts? Yes please! The conversation got back on track at the Center City location of Federal Donuts (1632 Sansom St.), over za’atar-spiced fried chicken accompanied by a particularly delicious honey donut. Me: How did you come up with the idea for Happy Bellies? Diana: Actually, nobody on the team did. Esther, my college roommate, had come to India to visit me last year in August. We did this crazy all India tour, and we were eating a lot of food. I think we were in Shimla in north India, but were eating a south Indian food, idlis. 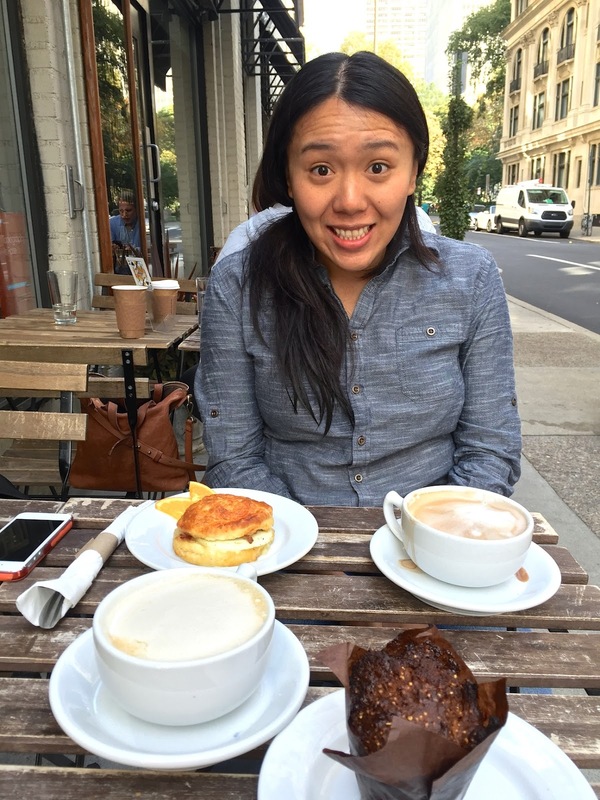 She’s very visual -- and is also Asian and in architecture – so Esther was like, “Oh these look like little pillows! So cute!” And then, “What if we made them into little pillows?” That was the question. They are made out of fermented lentil and rice. So they’re like steamed rice cakes in a way, but a little sour. Idlis are a very popular south Indian breakfast food. But they’re kind of tasteless until they take on the flavor of the sauces. It kind of relates to the character ‘Lil Idlis. We made them little children because they have no taste of their own. They’re very impressionable. So then how did you go from, “Maybe we should make them into pillows?” to starting an Essmart spinoff -- for lack of a better word? I don’t think we took it seriously until June of this year. We were in a fundraising mode, trying to be creative and seeing if we can supplement our operations with something completely different. 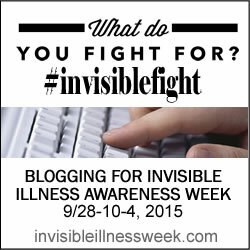 I don’t know if there’s quite a market for it, but it’s fun and ridiculous – kind of like us. Where did the name Happy Bellies come from? I think we ripped it off of somebody. There’s this bakery near our office that’s called Happy Belly Bakes. It’s one of my favorite bakeries because they have amazing cupcakes, my favorite being the banana walnut cupcake. There’s also a thing called “Delhi belly,”when you go to India and you eat the food and get diarrhea. It’s really bad. So, we’re still dealing with Indian foods but we are in contrast to Delhi belly. We are Happy Bellies! Yay! So how did you pick out which foods to highlight and make into characters? We chose the foods mostly based on their shape – and, I guess, how well known they are. I mean, personally my favorite food is not on the list. It would be a chicken kotu parotta. A parotta is south Indian, sometimes called a Kerala parotta. It’s a flatbread that’s layered and really rich. Like a flat croissant. I don't know how to explain it… It’s awesome. It’s like really oily, full of ghee and made up of a lot of layers. And what do you eat that with? Usually it comes with some kind of korma, like a veggie curry. But the way I eat it is kothu parotta. “Kothu” means “cut.” So, on a flat area, [chefs] take this stainless steel cup and they go boomboom-boomboom-boomboom-boomboom-boom and they chop up the parotta. Then they mix in egg and chicken and masala spices and cilantro. It’s so good. The first time I ate it, it reminded me of [Chinese] chow fun. I was like, “Oh my gosh!” And the best one I’ve ever had was in Polachi, Tamil-Nadu, down south close to the Kerala border. The parottas are crispier there. It’s ridiculous. So good. But … chopped up dough and chicken don’t make a good stuffed animal. It doesn’t look like anything. Yeah, that doesn’t look like a good stuffed toy. But what do look good are south Indian breakfast foods, which is a cuisine all in itself so you need to honor it. 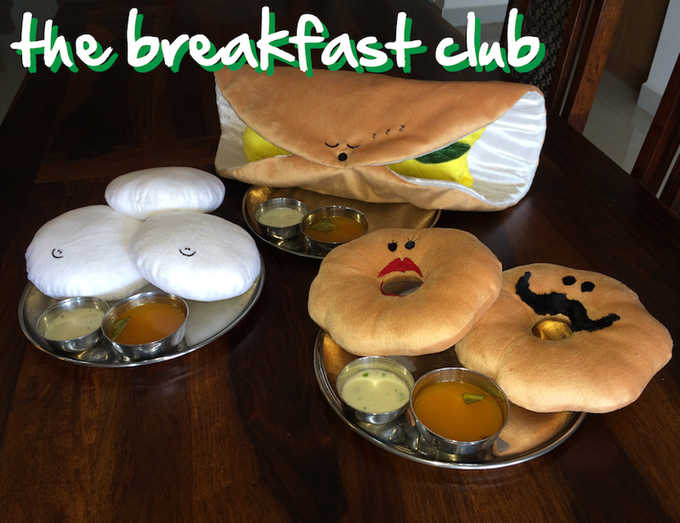 [Our characters] are the trinity, the triumvirate of the south Indian breakfast foods. Like the masala dosa, which is similar to an idli but the batter isn’t as fermented. It’s like a crepe with potatoes inside. We named it Dozing Dosa because it makes you really sleepy after you eat it. Yes, it’s very cute. And then we have idli because it’s also classic, and they’re really cute. Then vada. They’re kind of like savory donuts. We made them Auntie and Uncle Vada because vada are something that oftentimes people make at home and serve around teatime. They could also be a morning thing, but we needed something to represent south Indian hospitality. Everyone also seems to be an auntie and uncle. Yup! That’s true. If you don’t know the name of your elder, just call them auntie and uncle and that’s perfectly fine. So we chose those [three]. For our other crews - our other groups - we had wanted to do, for example, something based on foods in Kerala because they’re really funny-looking. But we decided not to do that because nobody knows what they are outside of India -- like an appam, or an idiyappam. 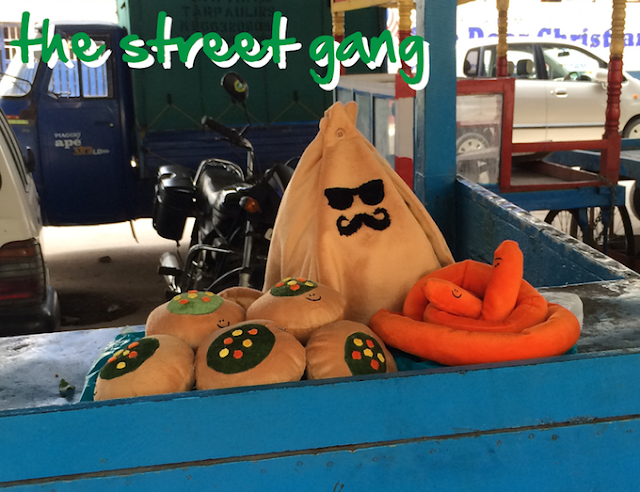 We ended up going with the street foods because they’re a bit more famous. I was gonna say worms! It’s basically deep-fried dough coated in a sugary syrup. Our first iteration of the jalebi was much thinner, much more like jalebi. But we wanted it to be cuddlier, so we asked the manufacturer to stuff it more. Then it started to look like a pile of poop, and now… We’re going to change the dimensions. It needs to be cuddly but can’t look disgusting. Then we chose pani puri, which are little fried crispy balls that are filled with flavored water. Now, do you have a favorite character? It’s hard to say. [pause] On the website, I wrote that it was the idli because Avantika already took the dosa. I would get the dosa, though. It’s the cutest and most accurate. The idlis are also very cute, but our first prototypes were closer to life size, which I thought were adorable. But we made them larger so that all together they’re like a cushion. I’m not quite sure how I feel about it. What kind of manufacturer are you working with? He’s a soft toy manufacturer. We just Googled a lot and found a guy in Bangalore who was actually decently responsive. [The fabric] is cut with machines but the embroidery is hand done. How are you hoping that the Kickstarter will relate to Essmart, either in the short-term or the long-term? In the short-term, fundraising. We’re funding it out of Essmart money and we’ll take all the proceeds back to Essmart as a revenue stream. Will it be a long-term thing? I have no idea. If it’s successful and people want to buy them, who knows, maybe we’ll set up another company and sell it. But right now we’re just seeing where the Kickstarter goes, and if there’s interest. the struggles of cooking Indian food, and more. To learn more or simply get your dose of cuteness and humor, head to the Happy Bellies Kickstarter page or their website. “Creative Good” is a new series on creative ways to bring good to communities around the world. I love hearing about new initiatives, so if you have suggestions for a company, project, or person (or something else!) to profile, get in touch!